Doesn’t anybody make food at home anymore? Costco opened a new store here in the nation’s capital last week and the manager, according to one newspaper account, suggested that one of the discount retailer’s big draws is all the food available there that customers can’t make themselves. “I say, if Americans are eating spanakopita, it’s because they got it at Costco,” the manager declared. But that’s so not true, as the kids in our food appreciation classes can attest. 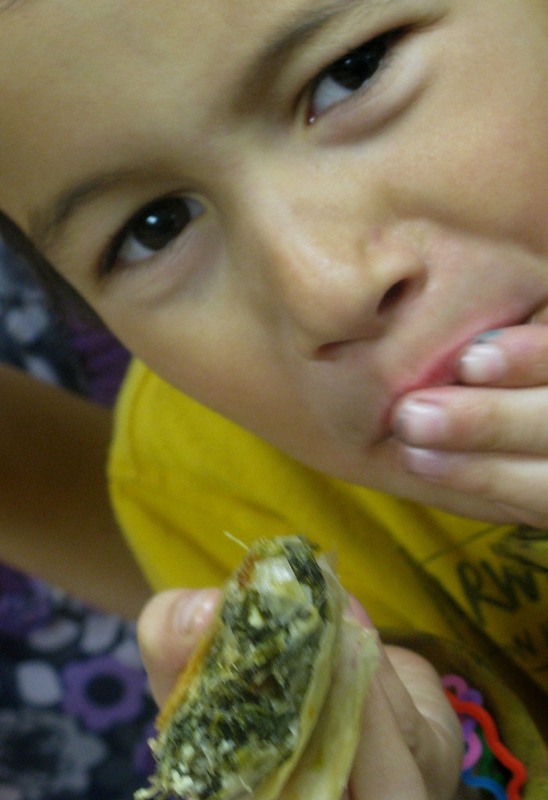 We ate spanakopita all week and we didn’t buy it at Costco. We made it ourselves! Translated from the Greek, spanakopita means spinach pie. It’s made by forming a crust with multiple layers of ultra-thin, ultra-light filo dough around a stuffing of spinach, onion, herbs and feta cheese. The classic dish is made in a big, round aluminum pan. But it’s been adapted into small, individual triangles for easier–and more hors-d’oeuvre-style–eating. It sounds a bit intimidating, layering all those sheets of dough. (The really hard part is stretching the dough, but we let the people at the filo factory worry about that.) In fact, it’s really pretty simple once you get the concept. The filo is typically available in the frozen food section of the supermarket. Once you’ve defrosted it, you simply remove the dough from it’s plastic packaging and unroll it, at which point the individual sheets become available, like pages out of a short stack of paper. But the dough does dry out quickly, so remember always to keep it tightly covered with plastic when you’re not using it. 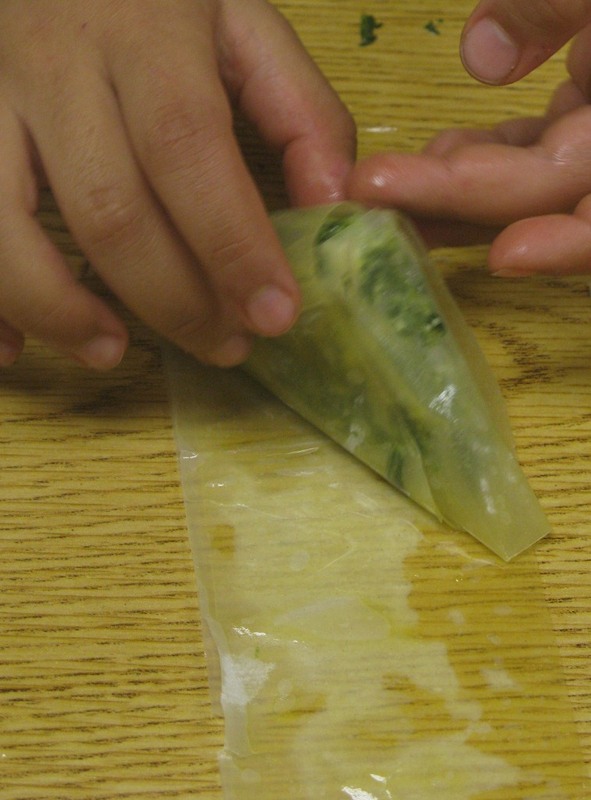 In our classes, we opted to make the spanakopita triangles, which turned cooking into something like arts and crafts. Folding all those triangles is perfect work for kids. To make around a dozen hefty triangles, start by defrosting 1 10-ounce package of frozen chopped spinach. Meanwhile, cut the root ends off 1 bunch scallions, chop the scallions including green parts into small pieces and saute over moderately low heat in 3 tablespoons extra-virgin olive oil until the onions are very soft. When the spinach is defrosted, dump it into a colander set inside a mixing bowl. Squeeze all the liquid our of the spinach–there will be lots of it. Discard the liquid, then crack two eggs into the bowl and beat them till they begin to froth. Mix in the spinach, then add the scallions and a fistful of chopped fresh dill leaves. 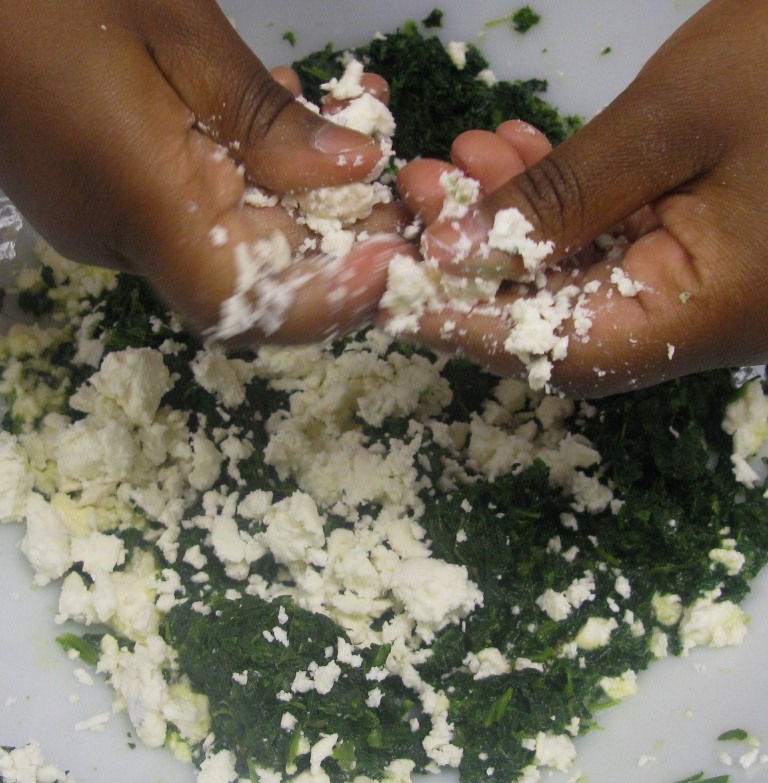 Finally, crumble 4 ounces feta cheese into the mix, blend well and season with salt and pepper. This is your filling. To assemble the triangles, lay 1 sheet filo dough on a clean, dry work surface and, using a basting brush, paint it lightly all over with extra-virgin olive oil. (Many recipes call for melted butter, but I think olive oil is more traditional Greek.) Add a second sheet and do the same with the oil. Repeat with a third and a fourth sheet. Now use a sharp knife to cut the stack of filo lengthwise into three strips. In the bottom left-hand corner of one strip place 2 heaping tablespoons spinach filling. Shape the filling roughly into a triangle, then lift from the bottom and flip the triangle onto the opposite edge of the strip as if you were folding a flag. We used a knife to get under the filo and do the flipping. One tip here: pull the bundle toward you slightly as you are turning it to maintain tightness. Continue flipping–left, forward, right, carefully aligning all the edges–until you’ve used the entire strip. Brush the triangle lightly with more olive oil and place on a baking sheet covered with parchment paper. When you’ve used all your filling, place the triangles in a 350-degree oven and cook 25-28 minutes, or until the triangles are golden.